The goal of this ticket is to explain how to create an extension for the Burp Suite Professional taking as implementation example the “Reverse Tabnabbing” attack. “Reverse Tabnabbing” is an attack where an (evil) page linked from the (victim) target page is able to rewrite that page, such as by replacing it with a phishing site. The cause of this attack is the capacity of a new opened page to act on parent page’s content or location. For more details about the attack himself you can check the OWASP Reverse Tabnabbing. Then the extension should contain a class called BurpExtender (into a package called burp) that should implement the IBurpExtender interface. The IBurpExtender interface have only a single method (registerExtenderCallbacks) that is invoked by burp when the extension is loaded. For more details about basics of extension writing you can read Writing your first Burp Suite extension from the PortSwigger website. In order to find the Tabnabbing vulnerability we must scan/parse the HTML responses (coming from the server), so the extension must extend the Burp scanner capabilities. consolidateDuplicateIssues – this method is called by Burp engine to decide whether the issues found for the same url are duplicates. doActiveScan – this method is called by the scanner for each insertion point scanned. In the context of Tabnabbing extension this method will not be implemented. doPassiveScan – this method is invoked for each request/response pair that is scanned. The extension will implement this method to find the Tabnabbing vulnerability. The complete signature of the method is the following one: List<IScanIssue> doPassiveScan(IHttpRequestResponse baseRequestResponse). The method receives as parameter an IHttpRequestResponse instance which contains all the information about the HTTP request and HTTP response. In the context of the Tabnabbing extension we will need to check the HTTP response. As seen in the previous chapter the Burp runtime gives access to the HTTP requests and responses. In our case we will need to access the HTTP response using the method IHttpRequestResponse#getResponse. This method returns a byte array (byte) representing the HTTP response as HTML. In order to find the Tabnabbing vulnerability we must parse the HTML represented by the HTML response. Unfortunately, there is nothing in the API offered by Burp for parsing HTML. IByteReader interface – this interface represents the Subject (or Observable) from the Observer pattern. This interface has methods for attach and notify the observers. HTMLResponseReader class – this class implements the IByteReader and for each byte of the HTML response will notify the attached observers. After each notification, the HTMLResponseReader will also ask each observer if they found a Tabnabbing problem (via IByteReaderObserver#problemFound method). IByteReaderObserver interface – this interface represents the Observer from the Observer pattern. The HTMLResponseReader will call the IByteReaderObserver#handleByte(reader, byte) for each byte from the HTML response. Each IByteReaderObserver implementation can call IByteReader#fetchMoreBytes(numberOfBytesToFetch) to fetch more bytes from the HTML byte array in advance if needed. HTMLAnchorReaderObserver class – this class implements the IByteReaderObserver interface and is capable to find the HTML anchor tag and check if it is vulnerable to Tabnabbing problem. JSWindowsOpenReaderObserver class – this class implements the IByteReaderObserver interface and is capable to find the window.open function call and check if it is vulnerable to Tabnabbing problem. 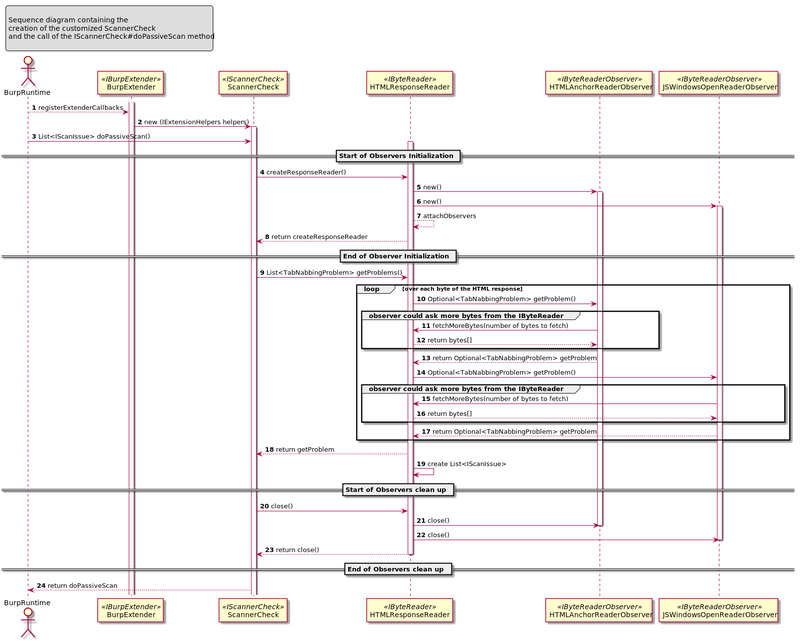 The following sequence diagram try to explains how the classes are interacting together in order to find the Tabnabbing vulnerability. If you want to download the code or try the extension you can find all you need on github repository: tabnabbing-burp-extension. If you are interested about some metrics about the code you can the sonarcloud.io: tabnnabing project. 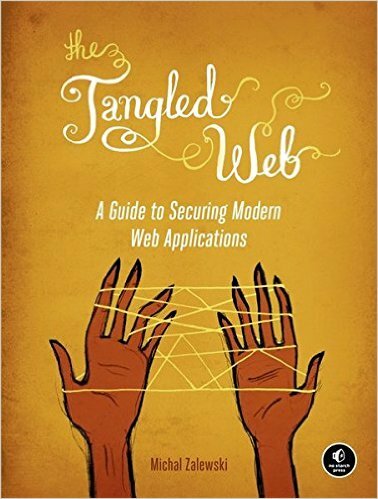 This is a review of the The Tangled Web: A Guide to Securing Modern Web Applications book. This books makes a great job explaining how the “bricks” of the Internet (HTTP, HTML, WWW, Cookies, Script Languages) are working (or not) from the security point of view. Also a very systematic coverage of the browser (in)security is done even if some of the information it starts to be outdated. The book audience is for web developers that are interested in inner workings of the browsers in order to write more secure code. This goal of this chapter is to set the scene for the rest of book. The main ideas are around the fact that security is non-algorithmic problem and the best ways to tackle security problems are very empirical (learning from mistakes, develop tools to detect and correct problems, and plan to have everything compromised). 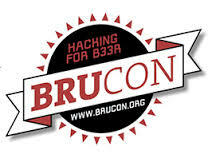 Another part of the chapter is dedicated to the history of the web because for the author is very important to understand the history behind the well known “bricks” of the Internet (HTTP, HTML, WWW) in order to understand why they are completely broken from the security point of view. For a long time the Internet standards evolutions were dominated by vendors or stakeholders who did not care much about the long-term prospects of technology; see the Wikipedia Browser Wars page for a few examples. In this part of the book the author speaks only briefly about the security features, knowing that the second part if the book supposed to be focused on security. The first security feature presented is the SOP (Same Policy Origin), which is also the most important mechanism to protect against hostile applications. The SOP behaviour is presented for the DOM documents, for XMLHttpRequest, for WebStorage and how the security policies for cookies could also impact the SOP. The last part is about different mechanisms that browsers are using in order to give special privileges to some specific web sites; the explained mechanisms are the form-based password managers, the hard-coded domain names and the Internet Explorer Zone model. For the author there are two ways that the browser security could evolve; extend the existing frameworks/s or try to restrict the existing framework/s by creating new boundaries on the top of existing browser security model. For the first alternative, the following solutions are presented: the W3C Cross-Origin Resource Sharing specification , the Microsoft response to CORS called XDomainRequest (which by the way was deprecated by Microsoft) and W3C Uniform Messaging Policy. For the second alternative the following solutions are presented: W3C (former Mozilla) Content Security Policy , (WebKit) Sandboxed frames and Strict Transport Security. The last chapter is a nomenclature of different known vulnerabilities grouped by the place where it can happen (server side, client side). For each item a brief definition is done and links are provided towards previous chapters where the item has been discussed.